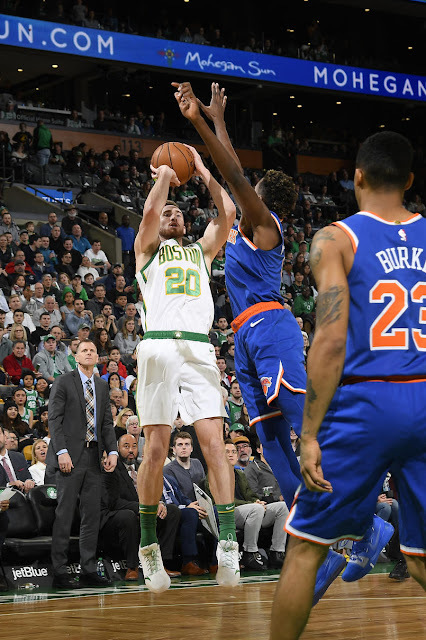 After the humiliating 117-109 loss to the Knicks, I may have to start calling this contest the CelticsLife Race-to-the-playoffs. But hey, hopefully it serves as a diversion until Danny Ainge and Brad Stevens figure it out. The number we were looking for was the percentage of total points from beyond the arc. Boston shot only 10-of-33 on treys for 30 points. Thirty points out of Boston's total of 107 gives us a percentage from threes of 27.5%. Red Brooks was the winner with 29.9%. CelticsKY came in second with 31.3& and David Anthopoulos was third with 31.7%. Results are below. The next game is on Friday against the Atlanta Hawks. Gordon Hayward had a fine offensive game against the Knicks, and his True Shooting Percentage for this one game was 58.6%. TS% rates a player shooting efficiency and takes into account ALL shooting, meaning 2-pointers, three-pointers and free throws. His 5-of-5 on free throws helped boost the number. We are looking for Gordon's True Shooting percentage for the Hawks game only. If you are curious about the stat, go to NBA.com - go to stats - go to players - go to points per game - go to player advanced leaders - then go to TS% (True Shooting Percentage). If you do this search, you will find players averaging in the 60-70% range for the season. Use that as a guide.